Academy Award organisers have acted at last over lengthy Oscar Awards night speeches. That’s because these lengthy speeches have characterised the recent televised Oscar award ceremonies. They are so common that people expect them to happen. 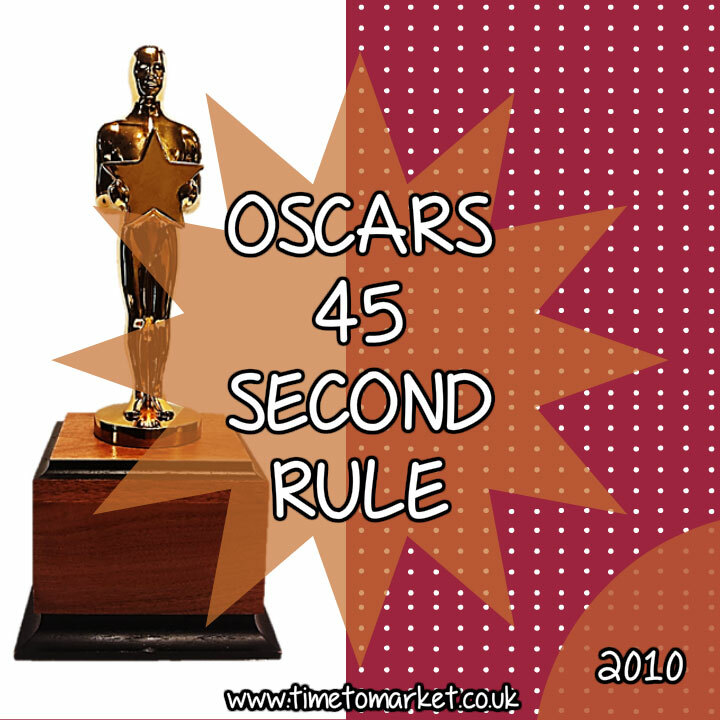 Therefore, we now have the 45 second rule. Lengthy speeches are clearly a problem, because they aren’t good viewing, typically. At issue are the long-winded, incoherent and largely self-centred speeches of winning stars and starlets. To the winner they might be endearing. But to the world’s TV viewers they have proved tedious. and boring. And of course, advertisers share that view. And, they pay the bills for the ceremony effectively. So, it’s certainly a case of he who pays the piper calls the tune. So, we have a new rule…at last. This year, say the organisers, winners will be restricted to 45 seconds of speech in front of the mike. So, 45 seconds to make their fulsome thanks to one and all involved in their success. And that’s it. No more gushing speeches. No plaudits for their highland terrier or their masseuse. And certainly no trawl through the personal memory bank. Here’s to brevity, wit and coherence in the film industry. But, we will have to see how they police this new arrangement. It sounds entirely do-able. But some stars might not appreciate being drowned out by music after their 45 seconds of speech-giving fame. You can discover plenty of public speaking tips and techniques with our regular series of public speaking tips. And, of course, when you are ready to really boost your public speaking skills you can always ask us to run a skills training or coaching session just for you or your team. So, please don’t hesitate to get in touch when the time is right. Telling It Straight is our very own public speaking tips newsletter. Packed with skills tips to help you with your next speech, why not receive it this month? The Principal Trainer at training business Time to Market. Based in Oxford, I run presentation and public speaking training courses, coaching sessions and seminars throughout the UK. Timetomarket.co.uk © 2019 | All Rights Reserved | PresentPerfectTM is the registered trademark of Time to Market Ltd, Sandford Gate, East Point Business Park, Oxford, OX4 6LB | Tel: 01344 859823 | Time to Market offers effective presentation skills, public speaking training courses and one to one coaching for presentations and public speaking.